In Chrome we can close all the tabs in a window while keeping a selected one open. Is there a keyboard shortcut to "close other tabs"? No keyboard shortcut i know about and checking google forums neither does anyone else. 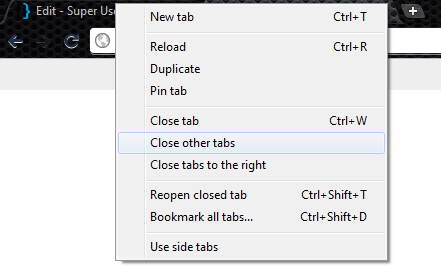 The shortcut key to close all other tabs is CtrlShiftAltW if you install Amazing Tab Shortcuts, freely available in the Chrome Web Store. I use it frequently for scripts, which I suspect is your use. None of them work. The easiest way is to right-click on the tab that you want to keep open and then click 'close other tabs'. The shortcut to close ALL tabs is Ctrl+Shift+W, to open a new tab is Ctrl+T, and to close the tab you are on is Ctrl+W. Also, if you close a tab by mistake and want to reopen it to the same page it was on, use Ctrl+Shift+T. Experiment with the rest like, Ctrl+Shift+E, etc. Here is an extension that assigns a keyboard shortcut to close other tabs. .
Works great on my Mac with Chrome stable channel. Then use FastScripts to give the script a shortcut. Not the answer you're looking for? Browse other questions tagged google-chrome keyboard-shortcuts or ask your own question. Sublime Text: Keyboard shortcut for close all other tabs? 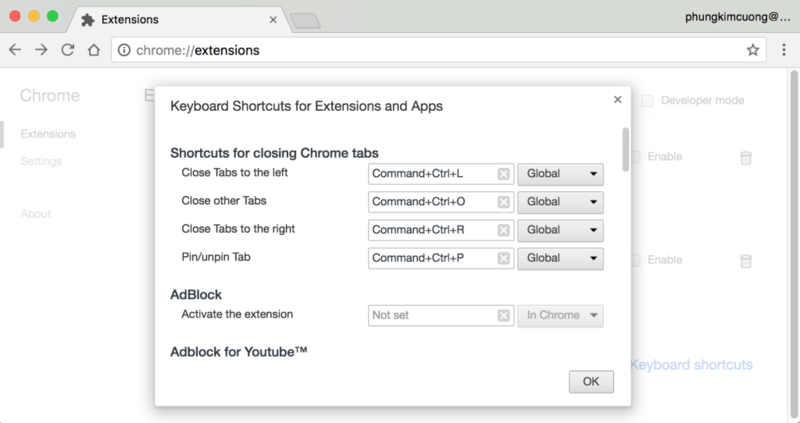 Keyboard shortcut to close Chrome Developer Tools on Mac? How to close all tabs/windows of a specific chrome user/profile? Does there exist a shortcut in Google Chrome to close all open Incognito Windows, but not all open Chrome windows?